Whale sharks are the largest fish in the sea. They can grow up to 40 feet (12 meters) or more and can weigh almost 21 tons! Whale sharks are filter eaters. They consume plankton, a variety of organisms that float freely in the water. Whale sharks like warm water and populate tropical seas around the world. Every summer, schools of whale sharks migrate to the water around Isla Mujures, a quick ferry ride from Cancun. 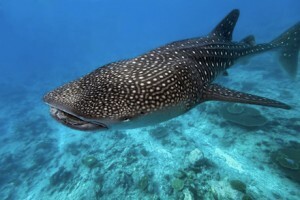 Whale shark season is from mid May until September but July and August are peak season. Despite their intimidating size, whale sharks are docile fish and usually do not disturb divers or snorkelers, who are trying to get a closer look at them. Whale sharks are listed as a vulnerable species. Unfortunately, they are hunted in some parts of the world. 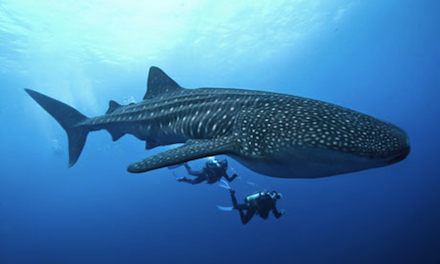 With their slow growth and slow reproduction, whale sharks are susceptible to extinction if hunting of them continues.